Lucy is, to outward appearances, a thirteen-year-old girl. Only she’s actually the last survivor of her home planet, which has been wiped out by killer creatures. She arrives on Earth, on the Isle of Wight, after a ten-year journey, during which she has only had an interactive hologram of her mother for company. Oh, and a lot of Earth TV, so she’s well versed in EastEnders and the like. Lucy is supposed to find a new home on Earth, and she’s been training for ten years, so she feels pretty confident she can find a way to fit in. But planning something in your head and then doing it in reality (lying, for example) is very, very different. She meets Jay and Emma (brother and sister) who find her likeable but weird. As a side note, Emma is dyslexic and dyspraxic, which becomes relevant to the plot but is most definitely not ‘an issue’. Jay and Emma’s mum, Sue, runs a holiday let, and Nick, one of the tenants, has a secret of his own (which also becomes highly relevant). Lucy knows that she has to keep her background – not to mention her high-tech spaceship – a secret, but she can’t help getting overexcited about things she’s only ever seen on screens before. And when she bumps into Mark King, from the band Level 42, she almost expires with ecstasy because she’s fallen in love with the thumping bass lines of his music (which ALSO become relevant to the plot. In fact, Ali is so clever that practically NOTHING in this book should be overlooked…). Just as Lucy thinks she’s finding her feet though, something horrific happens. It appears that one of the killer creatures responsible for wiping out her home planet has hitched a ride on the outside of her ship…and it’s waking up. Soon Lucy is forced to reveal far more about herself than she ever planned, and the last few chapters of the book become a race against time to save the human race – literally. I don’t read a lot of sci-fi. It doesn’t attract me, on the whole. But DESTINATION EARTH is, at its heart, about fitting in. And that is something I do find interesting, because haven’t we all felt, at some point, that we’re square pegs in round holes? Haven’t we all felt that stomach-knotting moment of ‘I don’t belong here’? And so we warm to Lucy, who is so keen to find a new home; who has not a shred of self-pity for the loss of her family; who finds physical human touch almost overwhelming because she hasn’t had it for ten years. We want her to be happy; we want her to find new friends and maybe even a new family. OK, so she’s an alien from outer space, and she can operate a frostlaser (I WANT ONE) and she can backflip across a field – but that’s all secondary. Don’t get me wrong: the last section of the book moves so fast you really, really don’t want to be disturbed while you’re reading. And the killer alien creature is HORRIBLE, eurgh eurgh bleurgh. But it’s Lucy who’s the real hero of the story, not the sci-fi-ness. 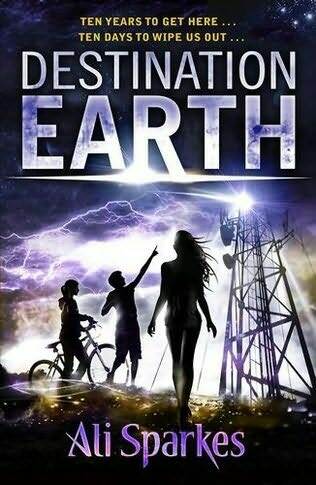 DESTINATION EARTH is published by OUP and I’d say that any kid of around nine upwards will enjoy it. Unless they get freaked out by bats. Or bass guitars. There’s also a fab book trailer on Ali’s own website.